During a thrilling overtime game on Monday night, the Ottawa Senators defeated the Boston Bruins 4-3 to take a 2-1 series lead. Apparently, some fans in TD Garden weren’t too happy about the outcome. Some of them could be seen throwing things either at Senators players or on the ice. 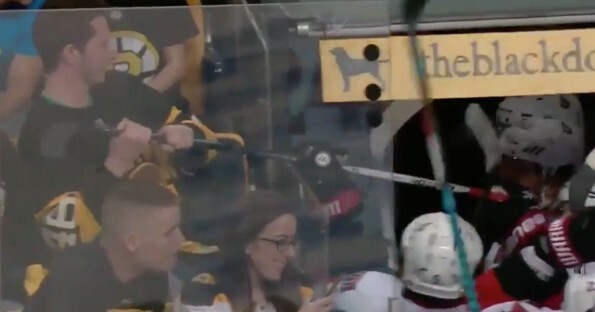 And then there was that one particular Bruins fan who was determined not to leave the arena empty handed. Watch as he attempts to take a stick away from Chris Wideman as he makes his way into the locker room. He didn’t come away with the stick AND he took a slash on the right hand for his troubles. Check out his reaction at the end one more time. I’ll bet he has a broken finger or two. And he deserves it.